So guys are you done with wordpress installation? 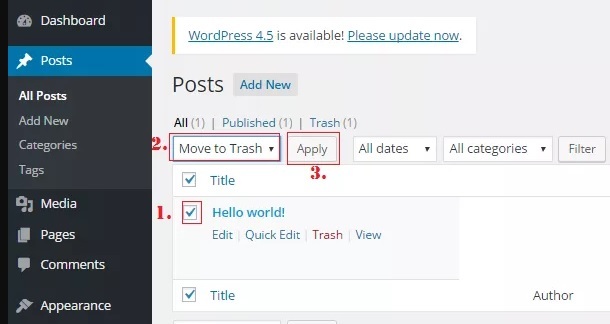 If not then please first go through Steps to install wordpress. If yes then go ahead and remove all unused page and post. 1. Firstly open all pages by selecting Pages from left side menu and All Pages from sub-menu like below. 2. 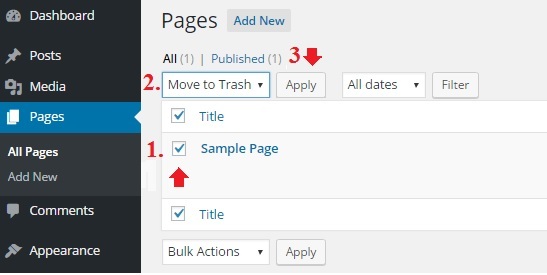 Now select “sample page” checkbox and change above to “Move to trash” then click on apply button. 3. Once you delete unused page then you can see screen like below. 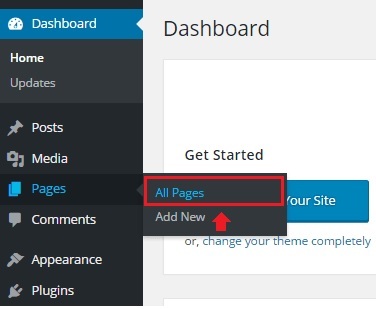 1.Similar to delete unused page firstly open all post by selecting posts from left menu and All posts from sub menu. 2. Now select “Hello world! !” post checkbox then change above drop down to “Move to trash” and click on apply button. You can also use Trash option (Below post) to delete any particular post. Hope you like this post and if you want to suggest something then you can write us in comment.